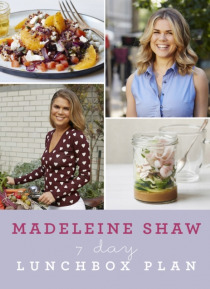 Nutritional health coach and bestselling author Madeleine Shaw brings you 7 simple and delicious lunchbox recipes guaranteed to get you glowing through the week. In our busy lives, it's hard to be healthy when you're pushed for time. Madeleine's lunchbox plan will give your beautiful body the good food it needs to function properly, and will help you to avoid the temptation for a processed sandwic… h or a plastic pasta pot. From super salads and soup to beautiful bowls of goodness, these recipes are all fast to prep and are the perfect quick fix of fresh, nourishing and filling food. Reach for your tupperware and give your lunchtime a lift!